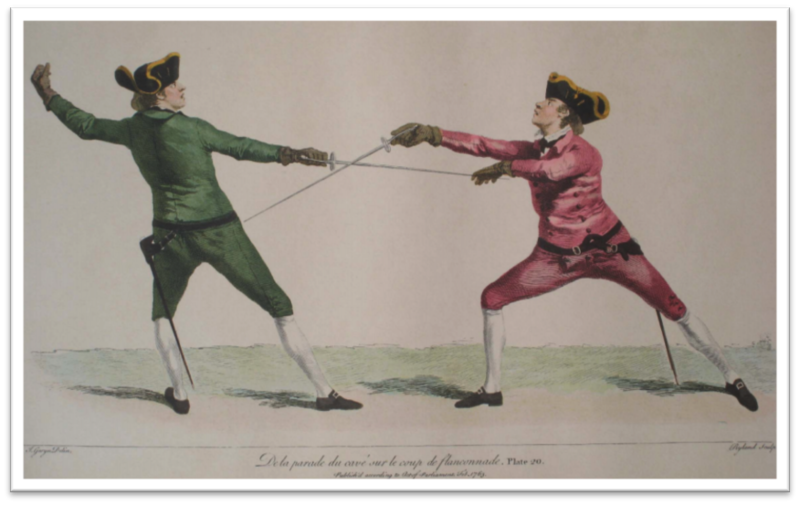 French fencing masters wrote about the cavé (pronounced cahv-ay) as a distinct fencing action. In French, caver means to cave in or collapse. The cavé thus described how a fencer would change or position his wrist or body to create a sharp angle—“caving in” from, say, a straightened position—for a specific fencing purpose, whether offensive or defensive. Sensibly, then, the cavé is sometimes referred to as angulation today. But that term doesn’t always cover all the ways the French writers used the cavé. This is because, as explained below, you can also cavé by using no angulation. For the French, there were three ways to cavé. From the on-guard position, you could cavé (1) at the hips or (2) with your rear leg. You could also (3) cavé the wrist of your sword arm, which itself was possible in three different ways. These methods were variously defensive or offensive. Importantly, these were not recommendations so much as taxonomy: as we’ll see, some of these ways of “cavé-ing” could get you killed. Danet’s cavé at the hips is demonstrated below. 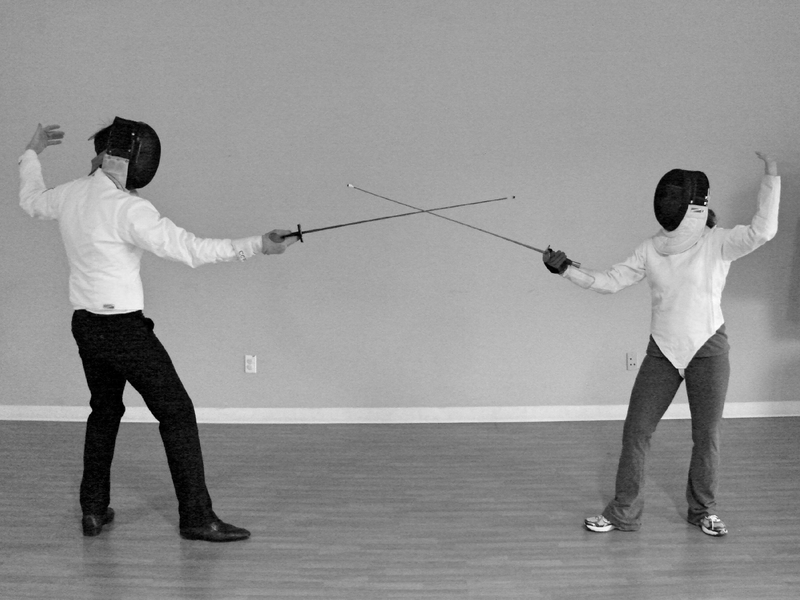 For comparison purposes, Figure 1 below shows two fencers on guard. The cavé at the hips is at Figure 2. 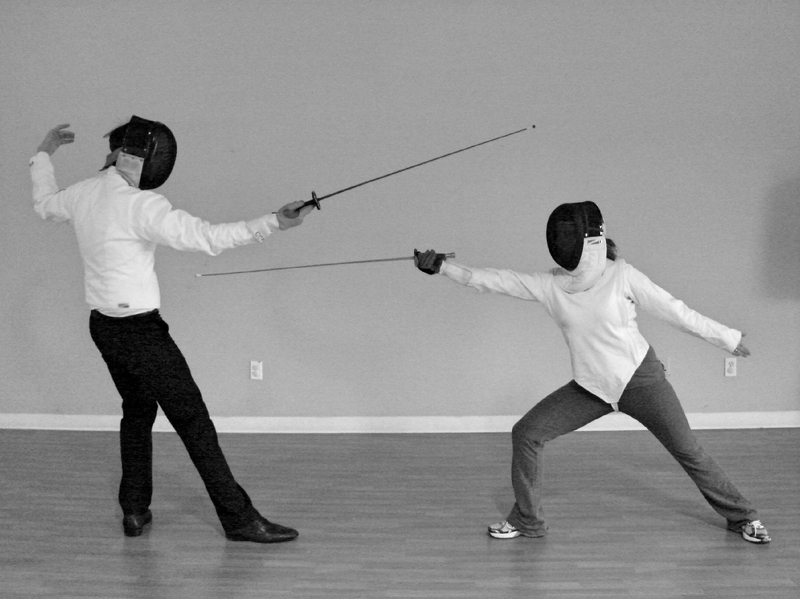 In Figure 2, the fencer on the right has lunged, and the fencer on the left has performed the cavé at the hips, tilting his torso forward and straightening his lead leg to avoid being hit in the low line. Danet disapproved of this sort of cavé. He believed it made a fencer neglect the parries, which provide more safety. Nonetheless, he did recognize that desperate times call for desperate measures, and, if you had to use it, the cavé at the hips avoided a low-line thrust—Danet gives the example of small-sword’s low quarte or quinte—by four or five inches. Nonetheless, in my experience, caving in like this is hard to suppress: it is instinctual to retract at the hips when you perceive your opponent has deceived your attempted parry and is lunging under the hand. It takes time to suppress this instinct and to learn to rely on the parry or judiciously retreat (or both). As mentioned, the cavé at the hips was one type of esquive. If you just had to defend without using your steel or footwork, Danet preferred the second type of equive. 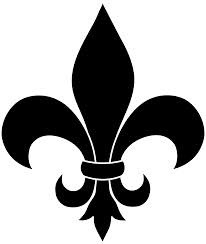 (Danet didn’t name this type, simply referring it to as the esquivement to distinguish it from the cavé.) To use this esquive when attacked, the defender straightened his lead leg and bent his rear leg “as much as possible” (le plus qu’il est possible), which pulled back his torso. (L’Art des Armes, vol. II, 134.) This pulled the defender’s torso back and away from the point, but he had to keep his lead foot on the ground to maintain his steadiness. Figure 3 below shows Danet’s esquive. Notably, this esquive was also useful against high-line attacks. In fact, Figure 3 notwithstanding, Danet demonstrates the esquive against an attack to the inside-high line. Still, there is some risk at using this esquive to the exclusion of a parry. Virtually all your weight is on that back foot. If the opponent quickly redoubles, then your cross-over retreat, accompanied by no parry, may not be sufficient to protect that open target you’ve provided. By the 19th century, discussing the cavé of the body, whether for good or ill, seems to have diminished. Obviously, this is one of those instances when translating cavation as angulation doesn’t work. 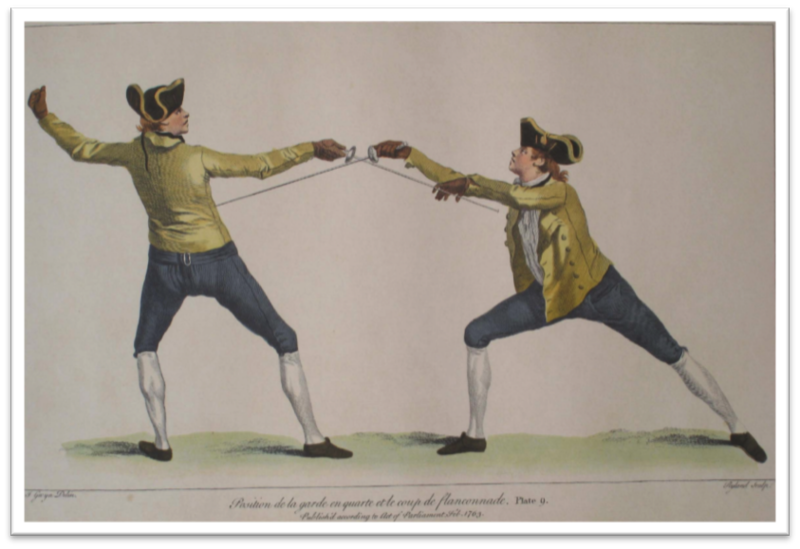 By far, the French writers used the cavé to describe how a fencer bent his wrist, either on the attack or to defend. There are three ways to cavé with the wrist. You can cavé to (1) oppose, (2) go around, or (3) detach from the adverse blade. Let’s look at each of these. Classical and historical fencers are taught to, when attacking, cavé the wrist—that is, angulate it—towards the opponent’s blade. This prevents the double touch, hinders the parry, helps keep the line open for attack, and angles the point towards the opponent’s body. Thrusting like this was known as thrusting “en cavant” (while angulating). See Figure 4 below. You can see that, even if the defender were to thrust now, the angulation of the attacker’s wrist would deflect that thrust. The cavé was also used as a distinct action against the flanconnade in which the opponent uses his blade to seize the weak of your blade, gliding along the length of your blade to land the hit. Angelo’s The School of Arms was the first text to use the word cavé to describe a parry which opposes the flanconnade. For that reason, I have used two different illustrations from The School of Arms to illustrate how the cavé defends against the flanconnade. First, Figure 5 shows Angelo’s demonstration of the flanconnade. Here, it looks like the attacker is just about to succeed. Now, compare Figure 5 to Figure 6, another illustration from Angelo’s book, highlighting what the cavé looks like when used as a defense to the flanconnade. In Figure 6, the defender has used the cavé to deflect the attacker’s blade and is poised to riposte. The reversing the edge from an inside to an outside, called cavé, is a parade where you must, with great swiftness, turn your inside edge to an outside, at the very time the adversary gains your feeble, by his binding, to direct his point in your flank, called flanconade [sic], you must form an angle from your wrist to your point, by which you will throw off the thrust, and the point of your sword will be in a line to the adversary. You must keep a straight arm, and maintain, with firmness, your blade, from fort to feeble. This is the worst way to cavé with the wrist. Angulating the wrist to get around a defender’s blade deprives the attacker of opposition to protect him from the defender’s blade, as explained above. In the 19th century, Grisier said that using the cavé at the wrist to go around the blade carried your hand “totally outside of the line and in the sense the most opposed to opposition.” (totalement hors de ligne et dans le sens le plus oppose à l’opposition). (Les Armes et Le Duel, 271.) He cautioned that it exposed too much of your target area to use it. Figure 7 shows this cavé from above the attacker’s point of view. As you can see, the attacker has sharply angulated his wrist to get his point around the defender’s blade, which is in quarte to close the inside-high line. And, but for the attacker’s cavé, the defender would have been safe. But, due to the attacker’s imprudent cavé, they are now both in jeopardy. For reference purposes, figure 7 shows the cavé at completion: you can see that the defender’s point directly threatens the attacker. Thus, had the defender counter-attacked by merely extending her arm before the thrust arrived, she would have, due to her proper angulation, simultaneously parried the attacker’s thrust and landed the touch. Alternatively, she could thrust now and assure a mutual death. In the past, writers recognized that some fencers deliberately snaked their point around your defending blade. In those instances, you were encouraged to deploy your off-hand to defend. Against those who thrust with angulation [cavation] I oppose with the left hand and, at the same time, thrust with the right. If the caveur parries with his left hand, as is very likely, the student should be careful to elude the left-handed parry by, at that moment, beginning to pass his thrust over the hand. And if the caveur wants to deceive my student’s hand in the same way, the student should quickly make sure of his blade by circling around with his hand. . . .
Against those who thrust in angulation, you can parry with the steel. But I prefer parrying with the hand because it is the lot of the caveurs to profit from one parry separated by another, which certainly uncovers the body. . . .
A celui qui tire par cavation je fais opposer le main gauche, et tirer en même temps la droite; si le caveur vient à parer de la main, come cela est fort possible, l’Écolier doit avoir soin d’éluder sa parade de la main, en initiant dans ce moment repasser son coup au-dessus de la main; et si le caveur veut tromper la main de mon Écolier de la même façon, il doit tout de suite s’assurer de son Épée en recirculant avec la main . . . .
On peut à celui que cave parer avec le fer; mais je préfère la parade de la main, parce que c’est le sort des caveurs de profiter de la parade écartée de l’autre . . . .
Gerard Gordine, Principes et Quintessence des Armes (1754). Finally, we have the use of the wrist cavé that is the opposite of angulation. This type of cavé describes how your arm’s bent position caves in to full extension to make a thrust. The most common example of this cavé thrust is the riposte after a prime parry. Anatomically, it is very difficult to maintain the prime parry’s angulation while extending to the riposte: quite naturally your arm goes from a bent position to a straightened one, detaching from your opponent’s blade. This transition from the bent, defensive arm to straight extension is the cavé in this instance. Being thrust in cavé form, prime and quinte do not allow the fencer to protect himself with the blade. If he needs to, he can use his left hand, which he advances and places in front of his body . . . .
La prime et la quinte, qui se tirent en cavant, ne permettent pas au tireur de se couvrir avec l’épée; il peut, en cas de besoin, y supplér, qu’il avance et place devant son corps . . . .
On that point, we’ll end with a final quote from Gomard, who limited the use of prime and quinte because those thrusts did not allow for opposition (we’ve referred to this before). 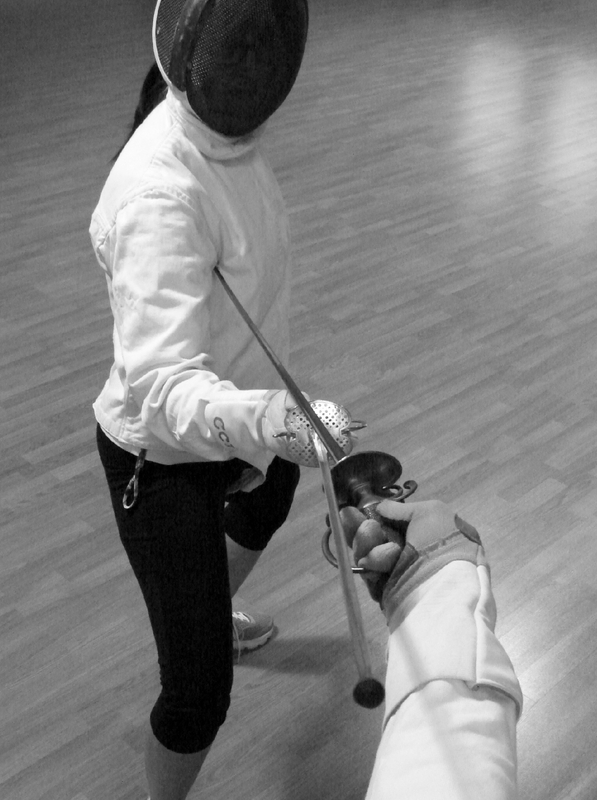 In fencing, there is the principle that the fencer who attacks should be covered, that is to say, protected from the enemy steel’s reach in the line where the attacking fencer delivers the thrust. Because, among the eight bottes, prime and quinte do not allow opposition with the blade—in that you can only thrust them en cavant—it is necessary therefore for these two to break with the principle of opposition or to have resort to opposition with the left hand. . . . We have already said that the bottes of prime and quinte should not be used to attack, but only as a riposte or remise. Il y dans l’escrime un principe qui veut que le tireur qui attaque soit couvert, c’est-à-dire garanti de toute attenite du fer ennemi dans la ligne où il porte de coup. Comme parmi les huit bottes, la prime et la quinte ne permettant pas l’opposition par le fer, puisqu’on ne peut les tirer qu’en cavant, il faut donc, pour elles deux, dèroger au principe de l’opposition, ou avoir recours à l’opposition de la main gauche. Nous avons déjà dit que les bottes de prime et de quinte ne doivent pas s’employer en attaque, mais seulement en riposte en remise. Thanks to Michaela Yesis for demonstrating in the above photos. 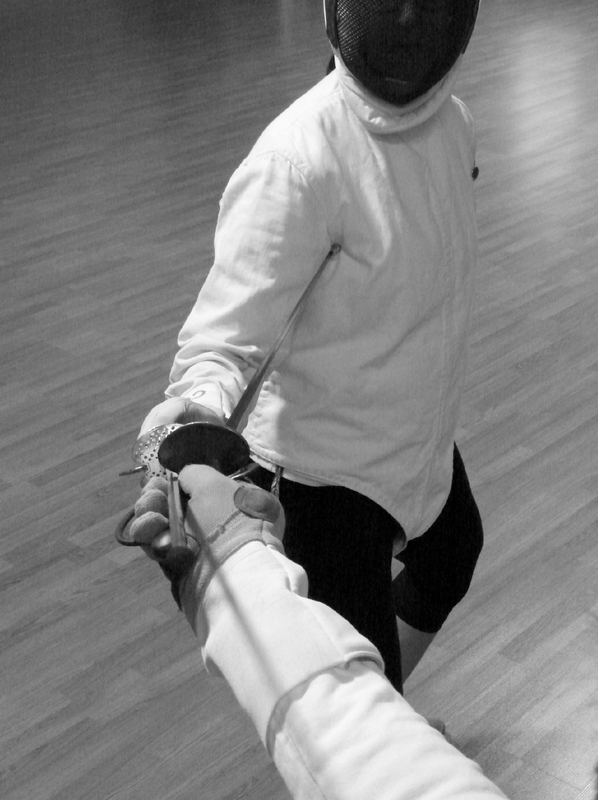 And, as always, thanks to Scott Wright for lending his photographic talents to Columbia Classical Fencing. This entry was posted in Theory, Weapons and tagged 18th Century, Angelo, cavé, Danet, Esquive, Flanconnade, foil, French, Gomard, Gordine, Grisier, La Boëssière, Small Sword, smallsword. Bookmark the permalink.